Yesterday at JoAnn’s I was having some canvas cut. It bothers me that the ladies at the cutting table do not have a pair of good shears to cut fabric. It is also annoying to have to trim the haphazard edge that results when they cut with shears that require so much force. I used the big 12″ drapery shears to even up the fabric when I got home. It got me thinking about the physics of levers, but I won’t bore you with that. Each pair of scissors I own I use for a special purpose. The two in the upper right are for paper. One is an old pair of Weiss that when I worked in a shop they were always being borrowed because they cut so smoothly, and the other has Teflon blades to cut though sticky things. 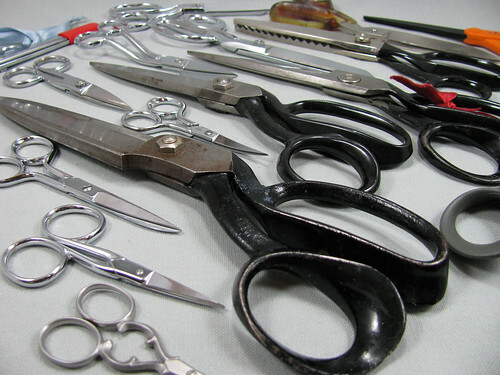 The shears with the red ribbon are the ones I use the most to cut things out, the other 10″ pair I bought when I misplaced the first ones and thought they were lost. I have smaller shears for ease in cutting curves and small things, and lots of various scissors for specific embroidery tasks. The little straight blade scissors mid-way on the left side I keep by my sewing machines. They are great for grading and trimming seams. I bought them on sale at JoAnn’s after another customer said they were her favorite little scissors. Now they are my favorite too. This entry was posted on Thursday, November 6th, 2008 at 3:00 am and is filed under Lace and Sewing. Tagged: Embroidery, Sewing. You can feed this entry. You can leave a response, or trackback from your own site. You reminded me of something that I saw happen a few years back. A customer at Rag Shop ( now out of business) brought in her own scissors and asked the lady to cut her fabric with them.